The United Church of Christ Yearbook and Directory provides statistics as reported by local churches and conferences of the UCC. 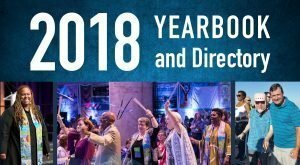 In addition, the Yearbook serves as a organizational directory including the various offices, persons elected by the General Synod to constitute the governing boards of the Ministries and other bodies. You, the churches, add your statistics into the National database right from your own church location. This page provides resources to assist you in submitting your annual church information online directly into the Data Hub. You will find helpful tip sheets and videos to assist you. The deadline for entering the data on the national database (so that it will appear in the 2018 stats) is February 28, 2019! Questions continue to come through the Southeast Conference. Contact our Registrar at [email protected] or call 404-719-6572. All the information from the denomination is posted on the UCC website, which contains video tutorials and information sheets to assist local churches in using the Data Hub to submit your annual data. Download the following PDFs from the UCC website. We strongly suggest that you have these available as you begin your data entry. Before entering data at each tab, READ THE INSTRUCTIONS because there are a few pointers that you will want to know PRIOR to data entry. The instructions will walk you through the actual entry steps. There is an Online Data Entry Form attached to the last pages (pages 5-6) of the instruction booklet that could be printed as a worksheet for your raw data. To work along with the entry form worksheets is the latest “Tip Sheet” that explains the fields that you will actually see on the database. You will also find instructional videos to help you learn how to update the church contact info, the annual church membership, the annual worship attendance, the annual church financial data, and the annual ministerial support info. Our usernames are a 6 digit number which includes the conference church number and your individual church ID#. More explanation immediately below! Our conference church ID# is 74, so this is the leading numbers for all of your usernames. Then, you add your own individual church ID# behind the conference number. Your individual church ID# should have been on former national communications. One little trick here is that your number may be only 2 or 3 digits. If so, place leading zeros in front of your individual number. Example: if your church number was “10”, then the username would be 740010 (you would have to add 2 leading zeros). If you do not know your individual church ID#, please email [email protected] for this information. When you login the first time each year, CHANGE your password to something that you will remember throughout the year 2019. If you ever need to have your password reset, email [email protected]. HOWEVER, this takes time and the national office must have specific info in order to do this for you. It is very important to change your password to something that you and/or those who will be doing the data entry will remember! The magical “Add” button means that the data is entered and there is no turn back! So, check your data carefully before hitting the magical button. If by any chance you have saved data that is incorrect, please send the correction to [email protected]. Step 3: Let Us Know! PLEASE send an email to the Southeast Conference office at [email protected] when you have completed your data entry. Remember, data entry must be done by March 7 in order to be listed in the 2019 Yearbook! All church who enter their information and complete the supplementary questions will be registered for a drawing for special prizes from the National setting. There are 32 prizes that will be awarded!